Ever wonder what’s really going on when the “Service Engine Soon” or “Check Engine” light comes on? 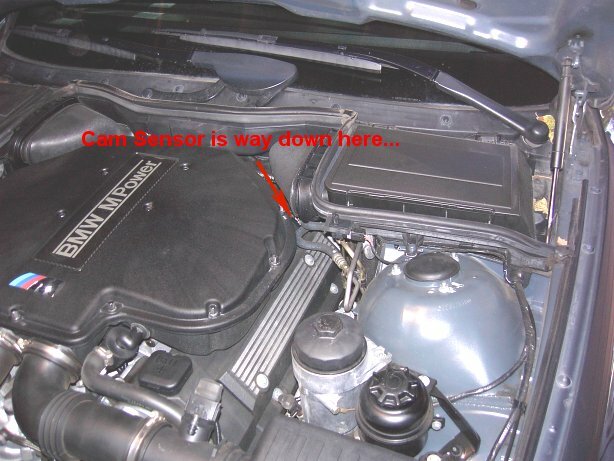 In June 06, I used a OBDII diagnosis system to find out what was happening inside my BMW. Here are step by step instructions on how I identified and replaced the failing component. 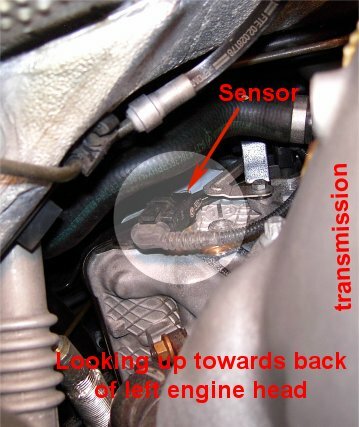 OBDII Code P0390 indicates failure of camshaft position sensor for exhaust cam on bank B (Driver’s Side). 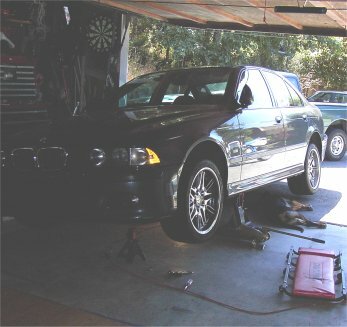 This is a frequent failure on E39 540i and M5 V8 engines. Other symptoms include slight loss of power accompanied with a deeper than usual ‘blatty’ exhaust tone. 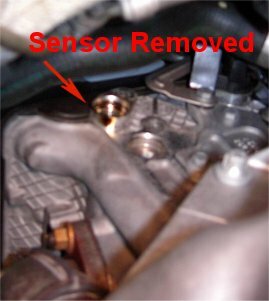 I ordered a new sensor from Rock Auto Parts for $105. With Rock Auto, I’ve found great deals, the prices are good and the shipping is fast. Unfortunately, this time they sent the wrong sensor (intake instead of exhaust). I’ll let them know to change their description, and I’m sure they will give me a credit for the part. 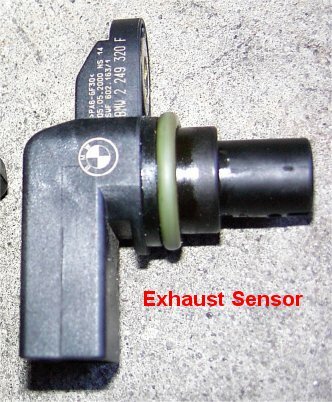 So, since I already had the old sensor out, I bought the correct sensor from Allison BMW Dealership in Mountain View California. They had six in stock, so I’ll guess that the sensor often fails. 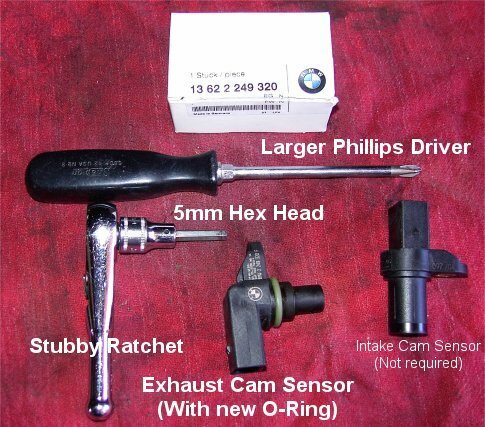 List price was $127 and they gave me a 10% discount through BMW CCA. Some folks prefer to change these sensors from the top. This was just too tight for me and I didn’t’ want to remove air ducts and hoses to get to the sensor. 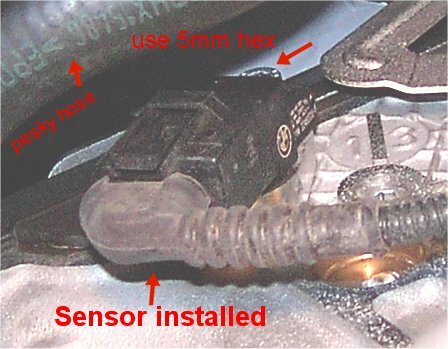 Instead, I jacked up the car and replaced the sensor from underneath. This is the easy part. 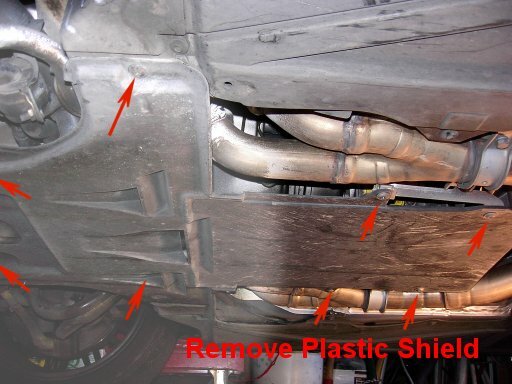 You will need a large Phillips screwdriver to remove and replace the plastic plate under the transmission. You will need a 5mm hex driver, and a small ratchet. Space is tight, so smaller is better. I jacked up the car on the left side (Driver’s side) and placed two jack stands for safety. Eight or ten screws hold the plastic shield/plate in place. It drops very easily. 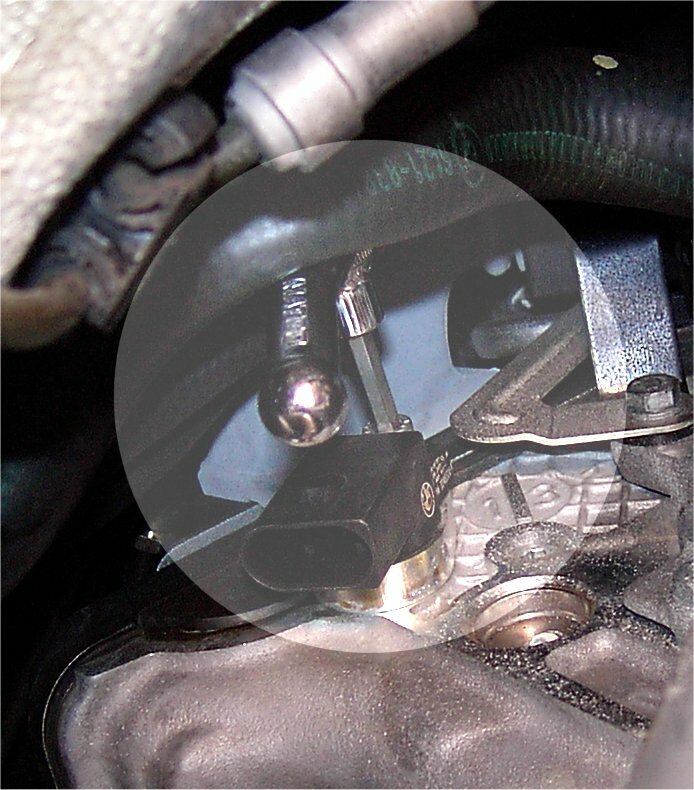 Look up between the header and transmission and you will find the sensor with a 5mm hex head holding it in at the rear of the left cylinder head. It is difficult to get a ratchet and hex driver around the water hose, but I managed to drive the hex bolt from both behind and in front of the hose. Once you have the sensor out, wipe the hole clean. Be sure to use a new O-ring when putting in the new sensor. You may want to put some thread lock on the bold on reinstallation. Don’t forget to re-connect the electrical connector. Replace the plate, let down the car and drive.